Located at 7030 Bay View Drive, Sodus Point, NY east side of the street. It is in the Sodus Bay Heights Golf Clubhouse in the entrance way on the wall between the banquet room and the bar. Unquestionably, the world’s greatest golf course architect, Robert Trent Jones, Sr. designed and redesigned more than 500 courses in 40 U.S. states and 55 countries. His name is synonymous with superior quality in golf course design, and one such course to benefit from his experience is Sodus Bay Heights. Born in 1906, in Ince, England, a town located on the Trent River (hence his middle name), Jones came to America in 1911 and his family settled in East Rochester, New York. As a young teen he developed a passion for golf and he launched his professional career at Sodus Bay Heights Golf Club in 1925 as the club’s very first golf pro. He also served as greens superintendent, and held these positions until 1929. An exceptional golfer in his own right, Jones’ real passion was in evaluating the courses he played and dreaming of how he could improve them. With the support and guidance of Sodus Bay heights second club president, James D. Bashford, Jones enrolled in Cornell University’s architecture program. While there he created a custom degree focusing on golf course design, becoming the first person in the world to formally study in this field. Jones designed several of the tees and greens at Sodus Bay Heights before launching his own golf course design company. Jones’ graduation from Cornell coincided with America’s Great Depression, which brought golf course development to a virtual stop. Still, he perservered and in 1931 designed Rochester’s Midvale Country Club. His career flourished after World War II, hilighted by working with golf legend Bobby Jones (no relation) in the re-design of Peachtree Country Club in Augusta, Georgia. He became the “go to” person for courses needing a facelift before the U.S. Open, and was nicknamed “The Open Doctor” as a result. His distinctive resume includes work on Baltusrol – Lower Course, Olympic Lake, Southern Hills, Oak Hill and Congressional. 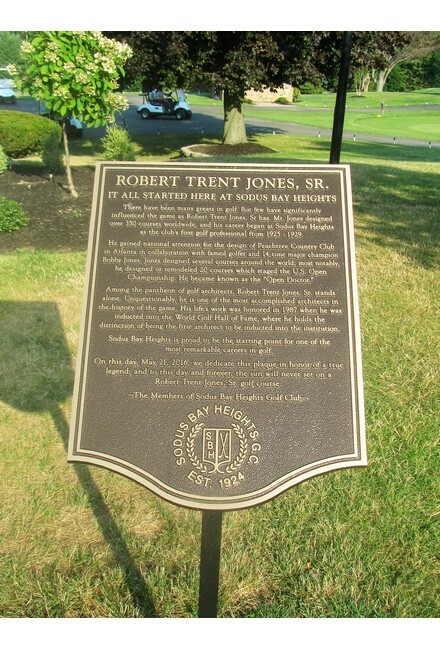 Robert Trent Jones, Sr. never lost sight of his roots and often returned to Sodus Bay Heights to visit. He continued to work on his own, as well as with his two sons, Robert Jr. and Rees, until his death in 2000. Also located at 7030 Bay View Drive, Sodus Point, NY east side of the street. It is right outside the main entrance of the Sodus Bay Heights Golf Clubhouse. There have been many greats in golf. But few have significantly influenced the game as Robert Trent Jones, Sr has. Mr. Jones designed over 350 courses worldwide and his career began at Sodus Bay Heights as the club’s first golf professional from 1925 – 1929. Among the pantheon of golf architects, Robert Trent Jones, Sr. stands alone. Unquestionably, he is one of the most accomplished architects in the history of the game. His life’s work was honored in 1987 when he was inducted into the World Golf Hall of Fame, where he holds the distinction of being the first architect to be inducted into the institution. Sodus Bay Heights is proud to be the starting point for one of the most remarkable careers in golf. 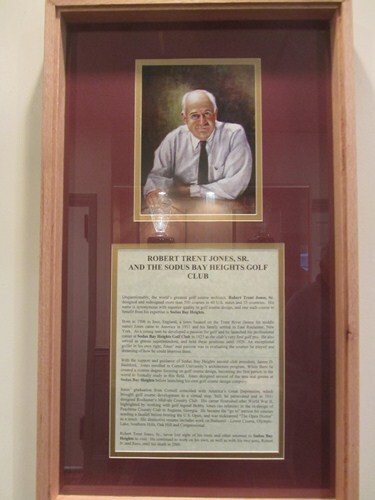 On this day, May 21, 2016, we dedicate this plaque in honor of a true legend; and to this day and forever, the sun will never set on a Robert Trent Jones, Sr. golf course.